US jobs recovery may be impeded by debt issues in D.C. Hiring will continue in 2014, but cautiously, according to CareerBuilder’s Annual Job Forecast. The forecasters added that debt issues among US lawmakers may continue to undermine a more accelerated US jobs recovery. In 2014, twenty-four percent of firms say they will be taking on new full-time employees, compared to 26% in the beginning of 2013. 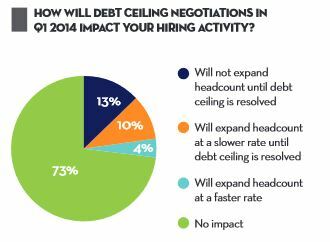 Twenty-three percent today say their hiring will be at a slower rate than last year, or will not consider increasing their workforces until the debt ceiling is resolved. Harris Interactive carried out a nationwide survey from November 6th to December 2nd; the survey included 2,201 hiring managers and human resource professionals across a broad range of industries and company sizes. Twenty-four percent of companies plan to take on full-time staff this year, compared to 26% last year. However, 10% are still unsure what their hiring plans might be in 2014. Thirteen percent say they expect to reduce their workforce, compared to 9% in 2013. Fifty-four percent say they anticipate no changes this year in their hiring plans. US Jobs – who have the best prospects? Hiring for science, technology, engineering and math (STEM) occupations is expected to increase considerably this year, with 26% of companies planning to take on employees in these areas. Employers say they plan to raise salaries the most in sales and information technology in 2014, as well as hiring new employees in these two sectors. Temporary employees are making up a larger proportion of the workforce within companies. Forty-two percent of companies expect to take on contract or temporary workers in 2014, compared to 40% in 2013. Forty-three percent of them plan to offer some temporary workers full-time, permanent positions. Recruitment of part-time workers – as a result of the Affordable Care Act, 17% of employers say they expect to take on part-time workers. Twelve percent say this is because of the Affordable Care Act. Repatriation of jobs – also known as “onshoring” jobs, means bringing jobs back home that were sent offshore (abroad). Twenty-six percent of companies say they plan to bring US jobs back home from abroad, compared to 23% last year. Widening skills gap – 51% of human resource managers say they have job vacancies for which they cannot find qualified candidates. Forty-six percent of respondents say these vacancies remain unfilled for at least three months. Training – 49% of companies say they plan to train unskilled people because of the skills gap, compared to 39% in 2013. Twenty-six percent are sending staff back to college to get advanced degrees, and either paying for all or part of the cost. Hiring people from high school – 27% of employers say they are approaching high school students in their schools.